Three polls this morning! The Léger poll for The Globe and Mail shows the Liberals with a 4% national lead, but only a 3% lead in ON. This poll is most informative in Québec, which was oversampled. There, the NDP and Liberals are tied for the lead at 28%, with the Bloc at 23% and the Tories at 20%. The BC numbers are also interesting, with the Liberals opening up an 11-point lead over the NDP (no, I did not mess up the Liberal/NDP order)! Very small sample in BC though. The Mainstreet poll for Postmedia is probably the most consequential one this morning; it has a huge sample of 5,630. It still shows the Tories leading, but by only 1 point, compared to 8 last week. In Ontario, the Liberals have a 7-point lead, a complete reversal from a 10-point deficit just last week. In this poll, however, the Liberals are third in BC, though all parties are within the margin of error there. Just like Léger and EKOS, Mainstreet has the Liberals in the lead in Québec, though in this case, it's tied with the Conservatives, with the NDP just two points behind. Remember the good old days where the daily Nanos for CTV was a lottery as to which party would be first? It feels that way now in Québec! Speaking of Nanos, it has the Liberal lead back up to 3%, on the strength of an ON lead that widened to 7.4%. 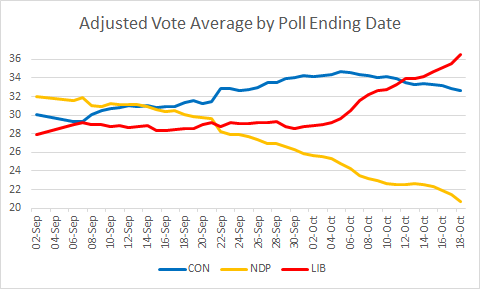 These numbers imply a 10-15% chance of the Liberals actually winning if the election were this week. 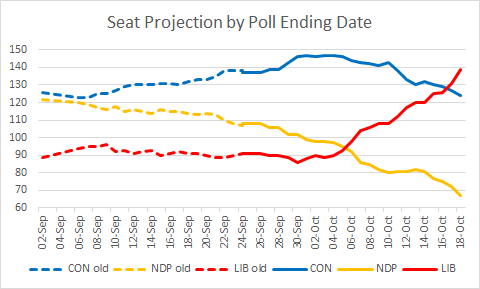 (I will do a post on how to interpret projections next week - some websites seem overly sanguine regarding the predictiveness of seat projections based on polls.) In fact, the probability would be even higher if I drop last week's polls (instead of counting them at partial value). This election is coming down to the wire! As you can see, a tie in the popular vote gives the Tories a 20-seat advantage due to the efficiency of their vote. 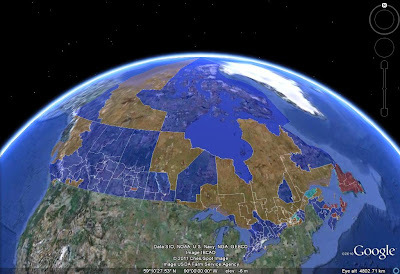 If you prefer the unadjusted projection (i.e. you don't believe my turnout adjustment), the Liberal odds of winning implied by these numbers is 25-30%.